ISBN 978-1-60358-817-1, 304 pages, $29.95 Full color photos and illustrations throughout. This anniversary edition comes almost 30 years since the first edition in 1989. There was also a 1995 edition, which I’m guessing is the one on the bookshelves of most people farming today. Given that carrots grow the same way they did 30 years ago you may be wondering if you need the new edition. Eliot Coleman’s wisdom was good in 1989 – how much better can it get? The first thing I noticed is that the new book is half the thickness of the old one. That’s mostly because the quality of recycled paper has made vast improvements. This book is 304 pages, the old one was 340. Most of the reduction is in the Recommended Tools and Suppliers section. Eliot recommends using the internet. Of course the internet doesn’t say which work well for Eliot, but he can be seen talking about which tools he likes on videos and in Johnny’s seed catalog. Much of the text remains just the same. The new preface is the same as that of the 1995 edition, with a bit more travel and research trips. The drawings have gone, to make way for the photos by Barbara Damrosch. The addition of color photos is the second most obvious change, and mouth-watering they are! I do regret the loss of a few specific drawings, especially the crop spacing ones and related chart. With hindsight, I realize the previous editions contained several crop spacing charts. To my relief, these have not disappeared, but have been consolidated and rationalized in the chapter about setting out transplants. The newer chart is more functional if less characterful. The other main kind of change is the introduction to newer tools and equipment: Jang seeder, 4-row and 6-row seeders, Quick-Cut greens Harvester, Cool-Bot, screen pyramids, and Quick Hoops. Coldframes have ceded to low tunnels; large soil blocks have been replaced by 6″ pots. The 15-page historical progress of moveable hoophouses has gone, to focus 6 pages on the current preferred type/method, but no diagrams. The Season Extension chapter has lots new. As I started reading I was disappointed at so little new. But then I started to find information I had forgotten, or not registered on previous readings! If, like me, you have not opened this book for 10 years, you’ll probably find useful tips. And Eliot only writes about things that have been tested out on his farm. Naturally, for those of us in different climate zones, this brings limitations. We’ll have to look elsewhere for more regionally appropriate details, but we can rely on the truth of what Eliot says works in Maine, and extrapolate from that. There is a new little chapter The Self-Fed Farm, on combining vegetable and small-livestock farming, which I welcome, for its plain common sense on how to be resilient and get the best food supply from a small farm. Much has gone from the 1995 28-page Winter Harvest Project chapter, which is now a slimmer 7 pages. Perhaps the extra material is covered in the Winter Harvest Handbook. The annotated bibliography has only a few additions. The notes that used to be in the margins are now collected up at the end of the book. The metric conversions are now in place in the text, everywhere needed. No longer do we need to make our own conversions, using charts. I’m happy about that, and it will make the book easier to use in the large metric part of the world. The chapter A Final Question – Why Farm? has been replaced by The Adventure of Organic Farming, which is Eliot’s answer to his earlier question. 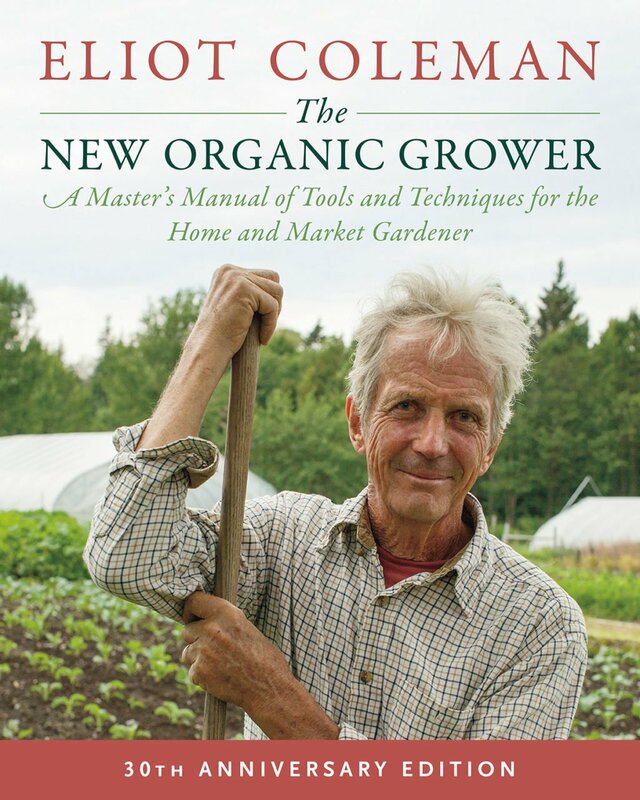 It’s a potted memoir of how rock-climbing led him to organic farming, along with his perspective (which is a long one, remember) on the Organic Farming movement. He quotes Eric Hoffer “Every great cause begins as a movement, becomes a business, and eventually degenerates into a racket.” We now have “organic” dairies of thousands of cows, and “organic hydroponic” vegetables grown without benefit of soil. Only by buying direct from the farmers can people be sure of good quality and care for the environment and the planet’s long-term future. Or by growing your own, of course. Have at it! If you haven’t opened any of Eliot’s books for ten years, it’s time you did. If you haven’t got the 1995 edition or the 1989 edition, buy this. If beautiful photos will help inspire you or your crew, buy this.